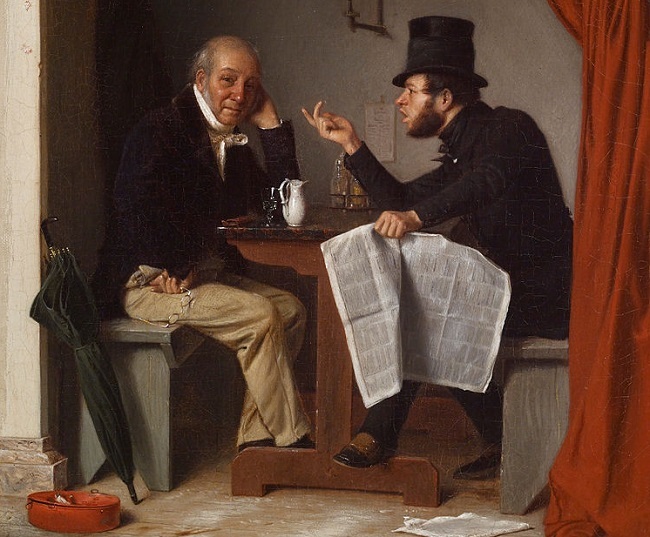 Detail from Politics in an Oyster House, 1848, oil on fabric by American artist Richard Caton Woodville (1825–1855). Image courtesy of Wikimedia Commons. Earlier this year various news sources reported that—for the first time ever—Americans are spending more in restaurants than in grocery stores. Although these statistics were soon followed by skepticism (the numbers compiled in the original report didn’t take into account the trend of buying groceries in big-box stores), there is little argument that restaurant receipts have increased: “Especially now that the recession has ended for the most part, consumers are looking to splurge a little bit,” remarks the president of the Food Institute. Foster’s attitude towards the new “eating-houses” was hardly more appreciative, but his colorful and harsh judgments are supported by other surviving reports. He divided the new public eateries into three categories: six-penny houses that dispensed quick and cheap midday meals to workers in the financial district; the more expensive chophouses, usually little more than glorified taverns offering slabs of meat with side dishes; and, still in a class by itself, the European-inspired Delmonico’s, which had been established during the 1830s. Although Foster made his name with sensational accounts of the seedier elements in New York, his preference for high-society haunts like Delmonico’s ultimately caused his downfall. (He delighted in satirizing society swells, but Foster “does seem to have been a bit of a dandy himself,” remarks his biographer Stuart M. Blumin.) Assuming the identity of a New York theater owner, Foster was caught forging a check for upscale clothing in Philadelphia. He spent the better part of 1855 in jail, awaiting trial for phony payments of several hundred dollars—although, according to his victims, the forgeries totaled in the thousands. Rufus Griswold, Foster’s childhood friend (and the late Edgar Allan Poe’s literary nemesis) reluctantly helped bail him out and the case was eventually dropped, but Foster died the following year of a flu-like illness. Notes: For nearly two centuries the Croton River has supplied Manhattan with its water supply via the Croton Aqueduct. Foster’s joking reference to Taylor at Bueva Vista evokes the military skills exhibited by General Zachary Taylor, who led 5,000 troops to turn back a Mexican army force three times the size at the Battle of Buena Vista, February 23, 1847. “Above Bleecker” was a common phrase for New York’s residential neighborhood north of Bleecker Street. In the eighteenth century, Carl Linnaeus established the system for classifying organisms. The Astor refers to the Astor House Hotel, which opened in 1836 in lower Manhattan and which featured fine dining in an elaborate courtyard surrounded by alcoves. “Beefsteakandtatersvegetábesnumbertwenty—Injinhardandsparrowgrassnumbér-sixteen!” “Waiter! Waiter! WA-Y-TER!” . . . If you don't see the full selection below, click here (PDF) or click here (Google Docs) to read it—free!